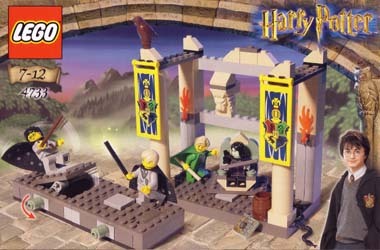 The world of Harry Potter Lego is an interesting one. Those responsible for designing the models have obviously put a lot of thought into each release. With the 'Duelling Club', fans of the franchise get the chance to go head to head with an opponent in a spelling casting duel. The floor of this playset is designed so that you can raise it to knock your characters from the platform. It also comes equipped with four Lego figures (Gilderoy Lockhart, Professor Snape, Harry Potter and Draco Malfoy.) as well as a barrel, snake, owl and magic scroll. The scenery included consists of a stone lion's head, mock lit torches and a couple of Hogwarts banners. And it is this attention to detail that really makes this worth purchasing. And the beauty is that you can collect the whole series and then mix and match the sets to create your own huge Hogwarts creation. Not only that, but this model comes equipped with two further designs that can be made out of the pieces contained in the box - which provides longevity. Young Harry Potter fans will be impressed with what they get to play with. Another great Lego release.